Between early October and now, the S&P BSE Metal Index has risen by 8% even after the recent fall in equities. While metal stocks are off their highs, there is no material change in the positive outlook for the sector. Product prices have maintained their uptrend and domestic demand could pick up in FY19, falling in step with an expected recovery in global demand. The one risk is of some heating up seen in fuel costs. In the December quarter, metals’ companies saw their sales increase by 7.7% over the preceding quarter and their material costs rose by 1.8% while power and fuel costs rose by 7.4%. While some of this is due to inflation, companies did not get their allotted quantities of domestic coal since priority was given to power generation companies. 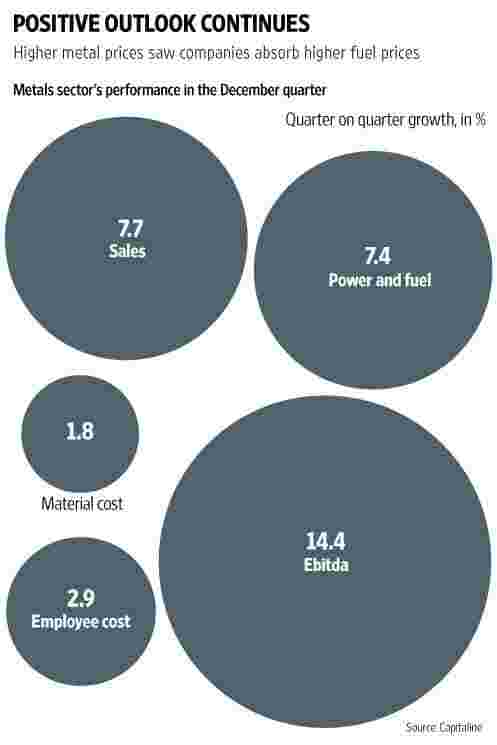 External coal purchases pushed up costs. Other inputs such as iron ore too had turned expensive. But higher realisations saved the day and most metal companies also made efforts to save costs. That’s why their Ebitda rose by 14.4% sequentially. Since most companies had completed their expansion plans, depreciation costs did not rise. They may have repaid part of their loans from higher cash flows, which may explain why interest costs declined. Tata Steel Ltd, for instance, reported a 3% increase in revenue and a 21% increase in Ebitda. Vedanta Ltd had reported a 13% increase in revenue and a 21% increase in Ebitda. In the current scenario, metal prices continue to remain firm in the current quarter as well. That raises the prospect of another good quarter for the sector. Companies had said that the coal sourcing situation is expected to improve in the current quarter. That could see costs trend lower as well. The main factors to watch for are: a recovery in domestic private capital investment, whether China’s demand for metals remains at or above expectations, and also whether China stays firm in its resolve to shutter polluting capacity in sectors such as steel and aluminium. There is one more factor for investors to consider. Companies are bidding for distressed steel companies and this may lead to a redrawing of market shares, debt and their future. Any undue stress on the balance sheet may be viewed negatively by investors.